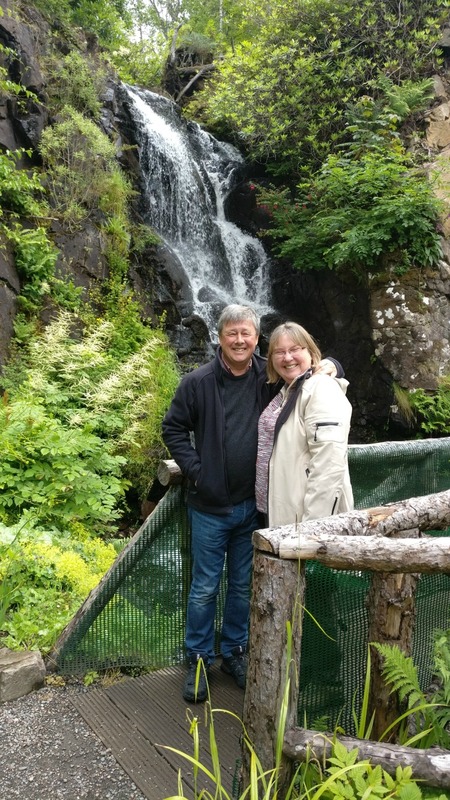 We had business at Sandcastle Cottage in Crail in the morning, so did not start our walk on the Fife Coastal Path from Dysart until early afternoon on a June day in 2016. We parked at the car park on Leven promenade before heading to Leven bus station to find a bus to Dysart. Having walked from Leven in the other direction towards Elie on another occasion, we had inside information about a perfect spot to have a little lunch before we headed off for our walk. There’s a branch of Kwik-Fit on the seafront at Leven, and just next to it is the Beach Snack Bar. It’s well worth a stop here as they offer a decent selection of lunchtime fare, and a touch of the exotic for afters. Puddledub Bacon and Square Sausage are amongst the menu items for filled rolls. I remembered from a previous stop that there was an interestingly named biscuit. The Monte Carlo biscuit is worth asking for, and a great accompaniment for a cuppa before your walk. We were heading for Dysart, and there are a number of buses from Leven to Dysart, including occasional express buses heading for Edinburgh. We hopped aboard one of these and were soon at our destination. Don’t let the speed with which you arrive at your destination fool you – you’re in for a tricky little coastal walk! Despite having checked the weather forecast, we found ourselves in a shower as we headed from the bus stop at the Royal Hotel towards the coast, but fortunately found shelter in the Dysart Coffee Cabin near the town hall for a supplementary coffee while we waited for the rain to pass over. 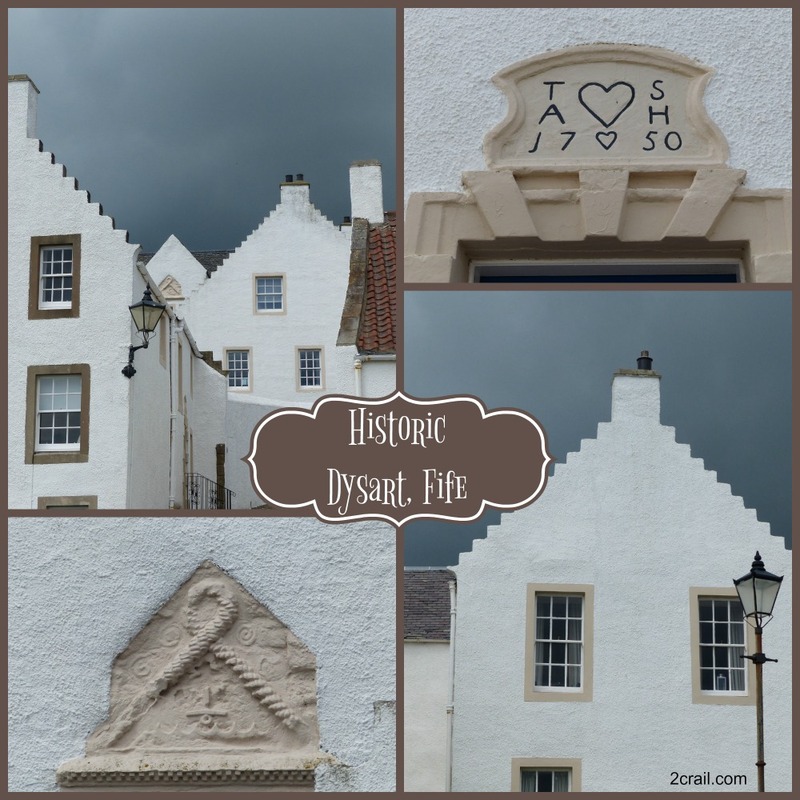 There are some very pretty little houses around the historic part of Dysart. 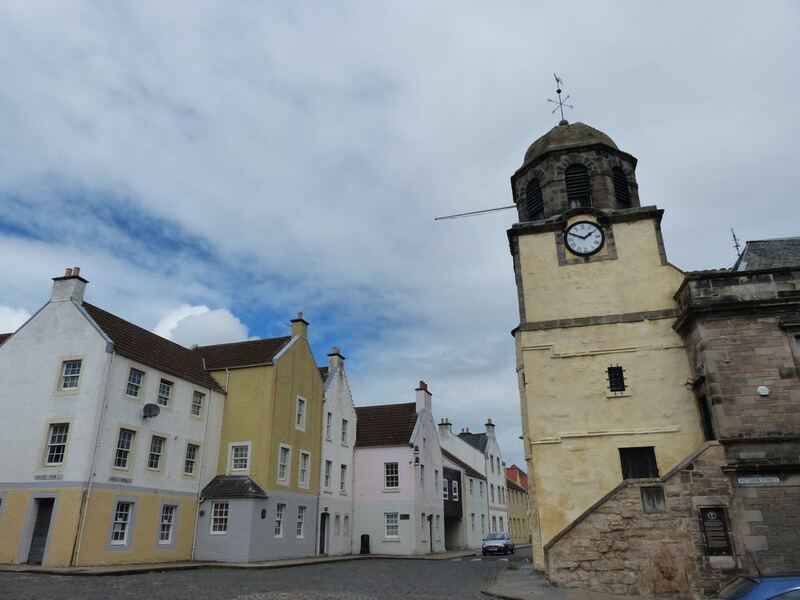 The town is now a suburb of Kirkcaldy, but in times gone past it was a Royal Burgh in its own right and had trading links with continental Europe. 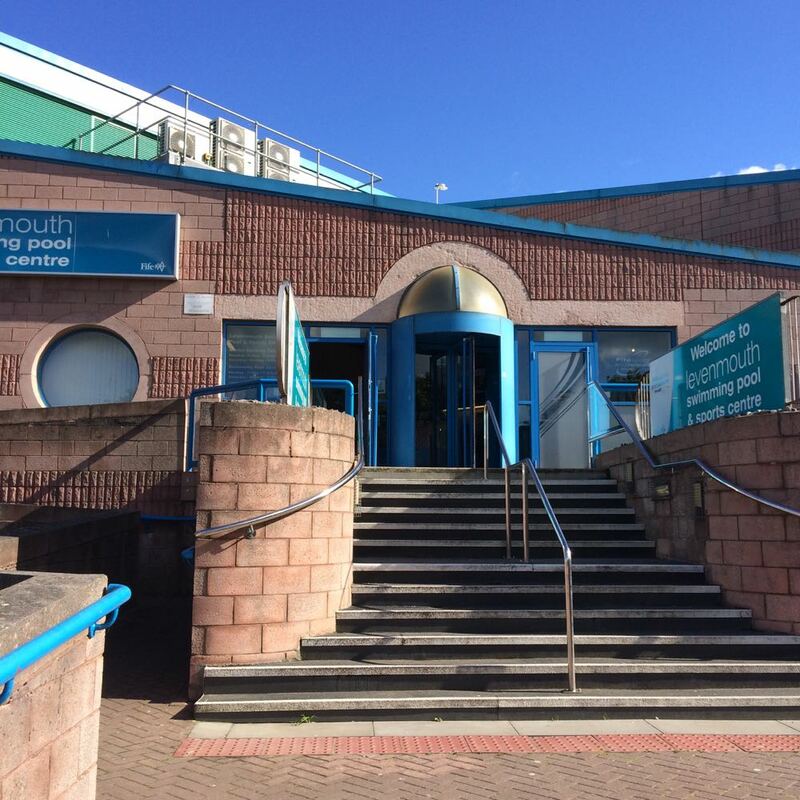 We didn’t visit the harbour on this occasion, but if you want to find out more about it, then our post about walking from Burntisland to Dysart has the information. 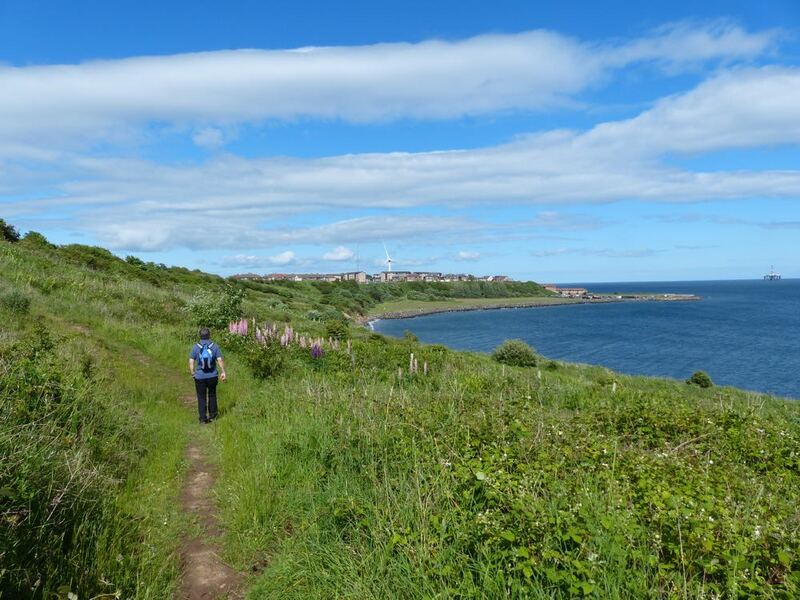 We turned left as we reached the coastal path, and set off towards West Wemyss. 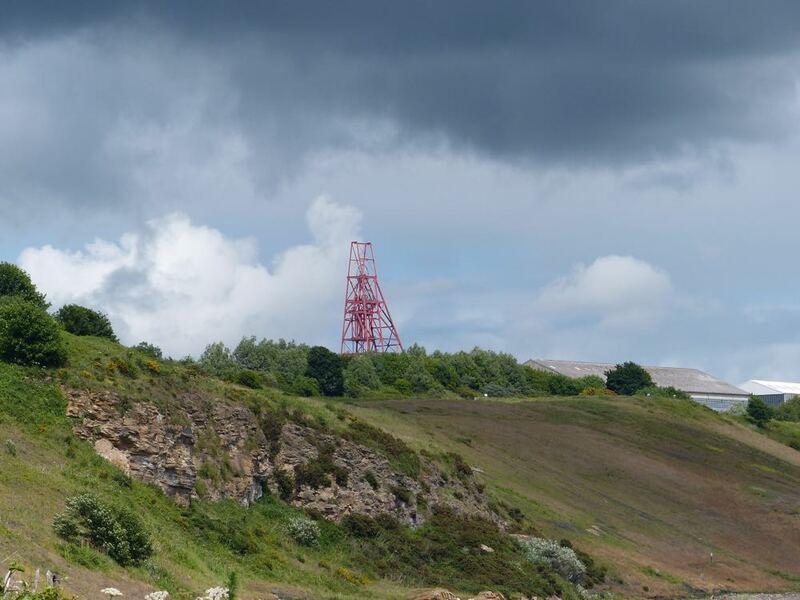 The path climbs first of all towards the wheel of the Frances Colliery, which has been left as a memorial of the industrial past of the area. You’ll also find stone markers telling the stories of the men and women who “wrocht” (worked) at Frances Colliery. There is a list of names of those who lost their lives working in the colliery, a stark reminder of how dangerous this occupation was. 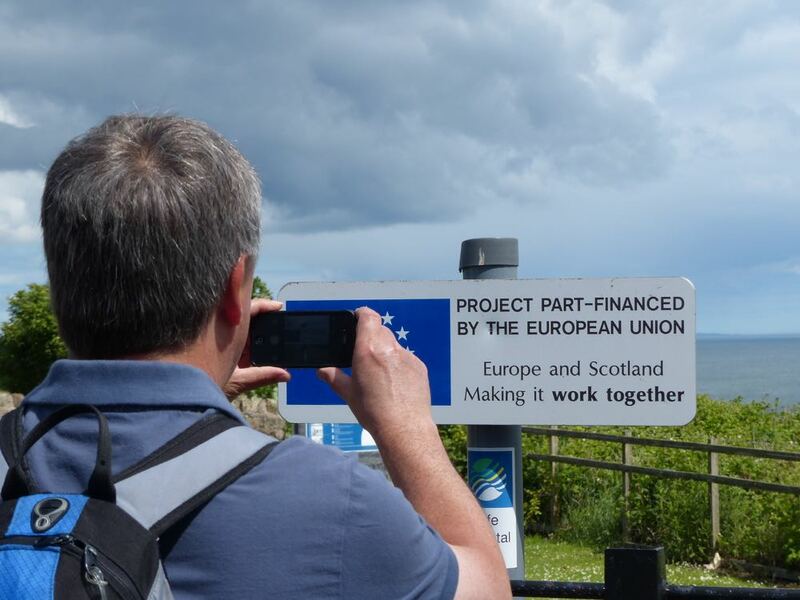 Since the closure of the pits, the area has attracted funding from the European Union to create parts of the Fife Coastal Path and to regenerate the area which has suffered from serious unemployment. It was particularly noticeable to us when we walked as at the time all the news was about the impending vote on our membership of the European Union. 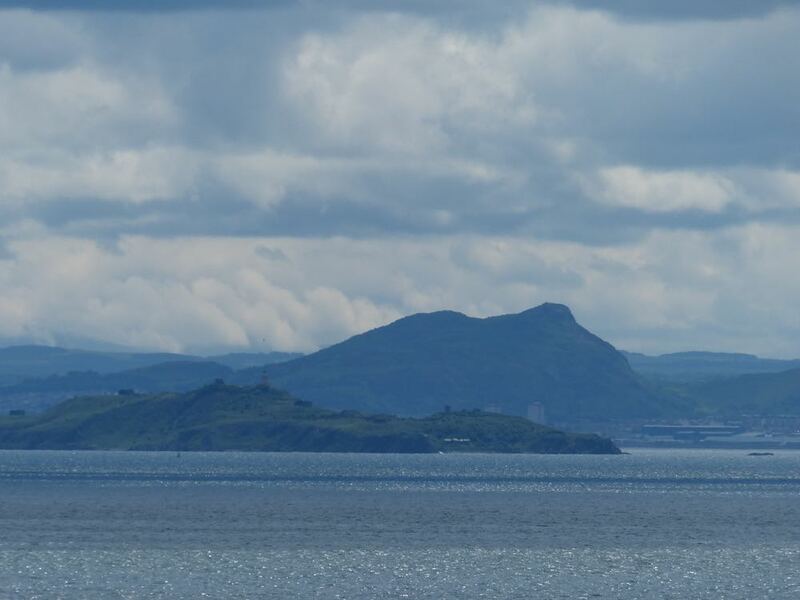 From the vantage point near Frances Colliery we could see clearly across Inchkeith towards Edinburgh and Arthur’s Seat. As it was early summer, the wild roses were in bloom providing an amazing scent. Views towards West Wemyss looked positively Mediterranean in the sunshine. As we continued towards West Wemyss, we passed the ruins of West Wemyss Castle which is marked on the Footprint Map as “Chapel Garden”. 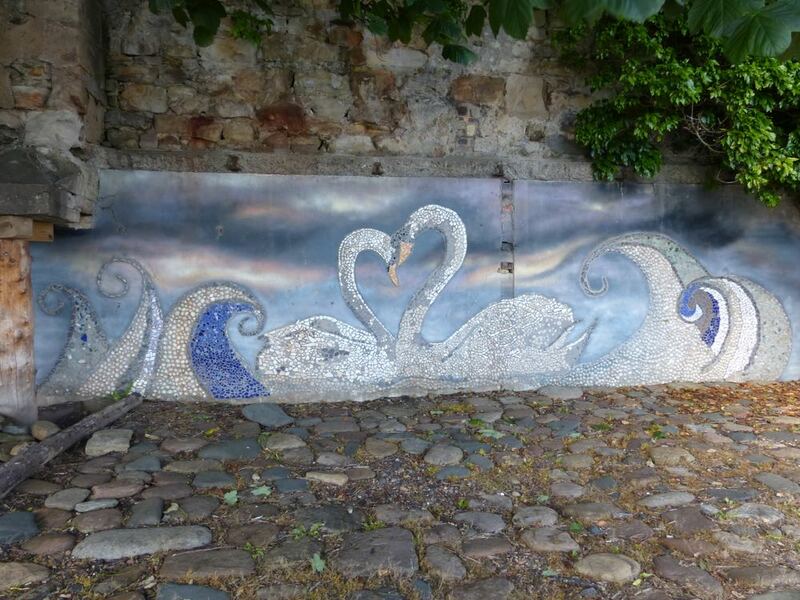 As you enter West Wemyss there are some murals to find on the buildings beside the path. 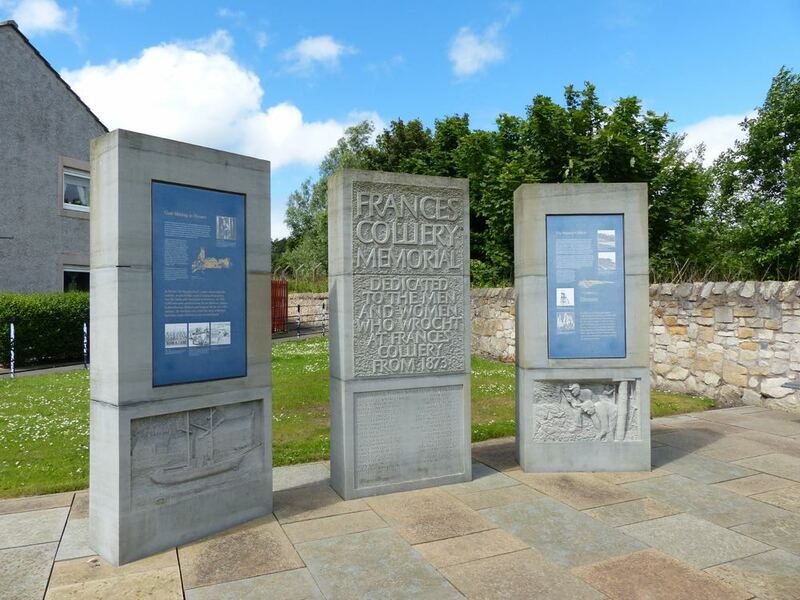 These were created as a community project at the entrance to the former Victoria Colliery. 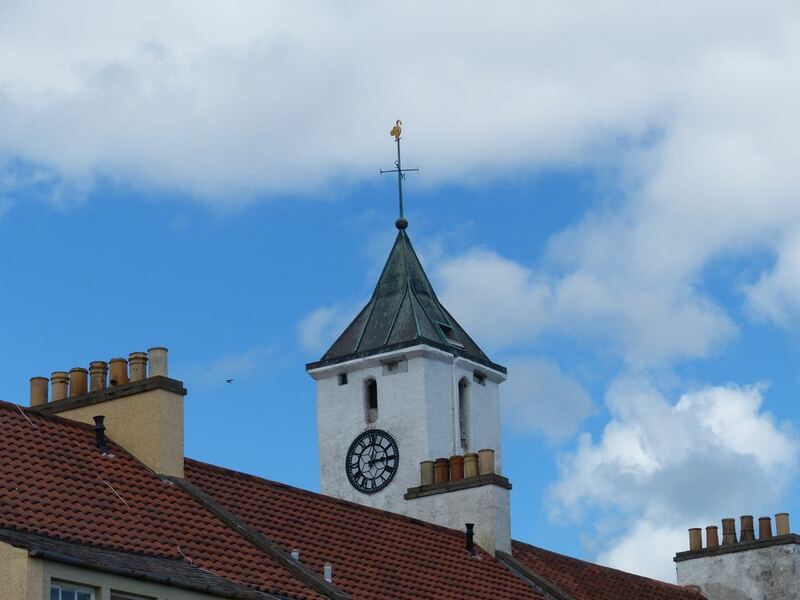 The swans are a reminder of the Wemyss family crest (a swan) which can be seen featured in many buildings and indeed the weather vane in nearby West and East Wemyss. 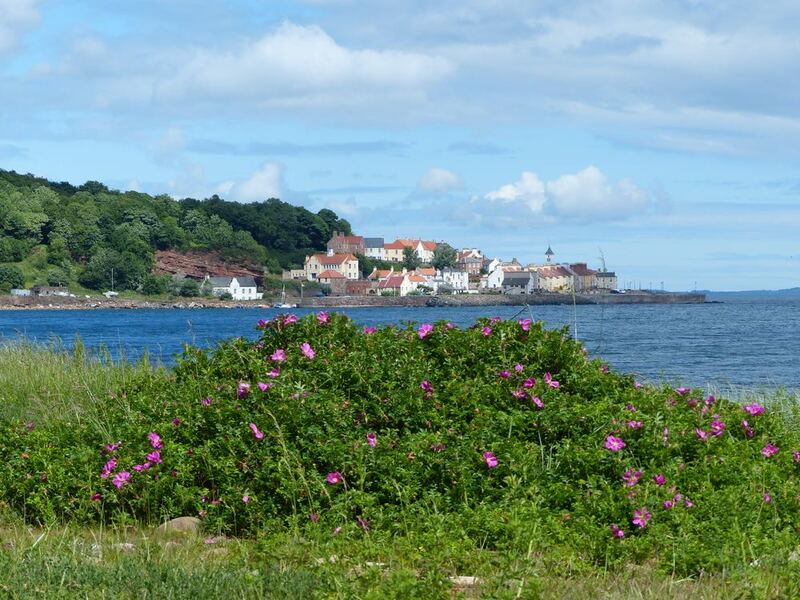 Keeping to the coastal path, we bypassed the village of West Wemyss which appeared very quiet and in parts quite run down and boarded up – a real difference to the initial impression we’d got from a distance as we walked towards it. There has been a deal of reconstruction around the sea wall at the east end of West Wemyss and the path is easy to follow and of hard standing underfoot. 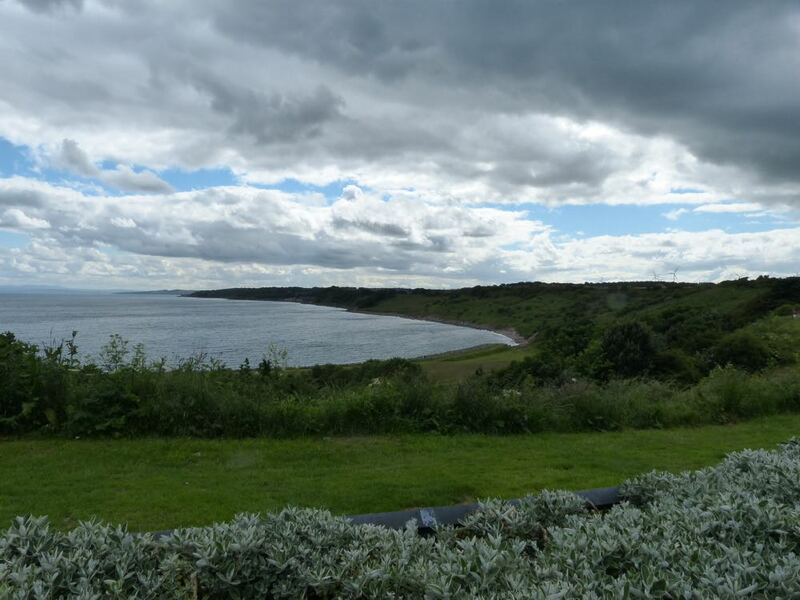 You can see below the path, and the current day Wemyss Castle on the cliffs to the left of the photograph. We headed along past the ruins of Michael Colliery towards East Wemyss. This area saw the worst disaster in Fife’s mining history when in 1967 a fire broke out in the colliery where 311 miners were working a night-shift. Nine men lost their lives that night. It’s difficult to imagine the scale of the industry in these parts as it all seems so peaceful now. 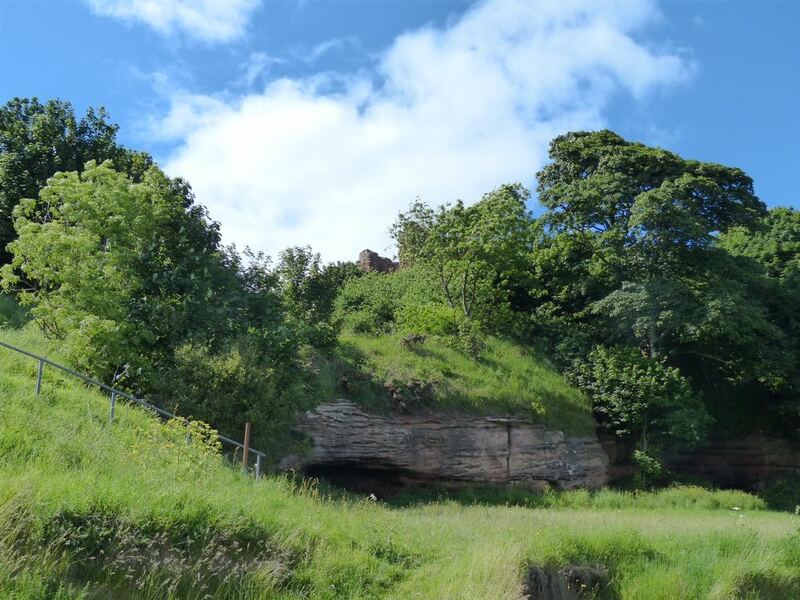 As we walked through East Wemyss we passed a variety of different memorials (including one about the birth of musician Jimmy Shand), and read a little about the East Wemyss caves which are of historic significance as they were inhabited for thousands of years and contain remnants of Pictish carvings. 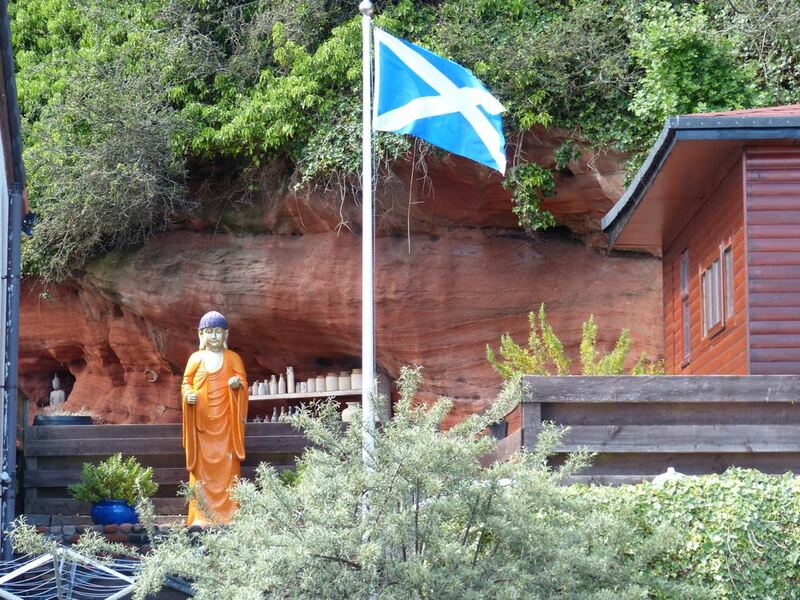 There’s a curious garden where we saw a Buddha statue which had thoughtfully been provided with a knitted wooly hat. 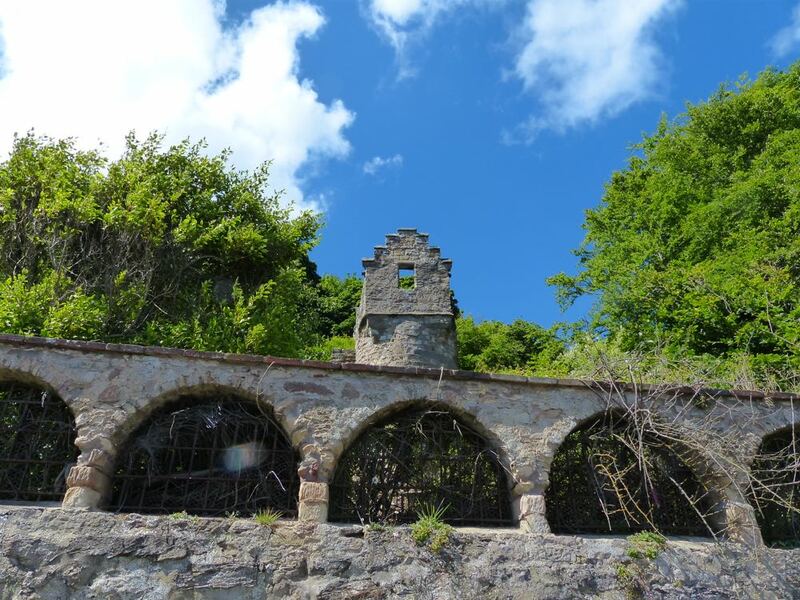 There are steps leading up to the ruins of Macduff Castle which we decided not to take on this occasion – but if you’re walking this way, head up there! This is actually where the Fife Coastal Path follows the route of an old railway and we’re sure that it must be easier walking than the route we chose. We met a local dog walker and asked if it was possible to walk along the shore line as it was high tide by this time. We were assured that it was possible to do so. I had walked this way at low tide without any difficulty, but at high tide there are areas where you need to scramble over large tree trunks, rocks and through dense vegetation. The views towards Buckhaven were still favourable, but as you can see the undergrowth was quite challenging at this time of year. 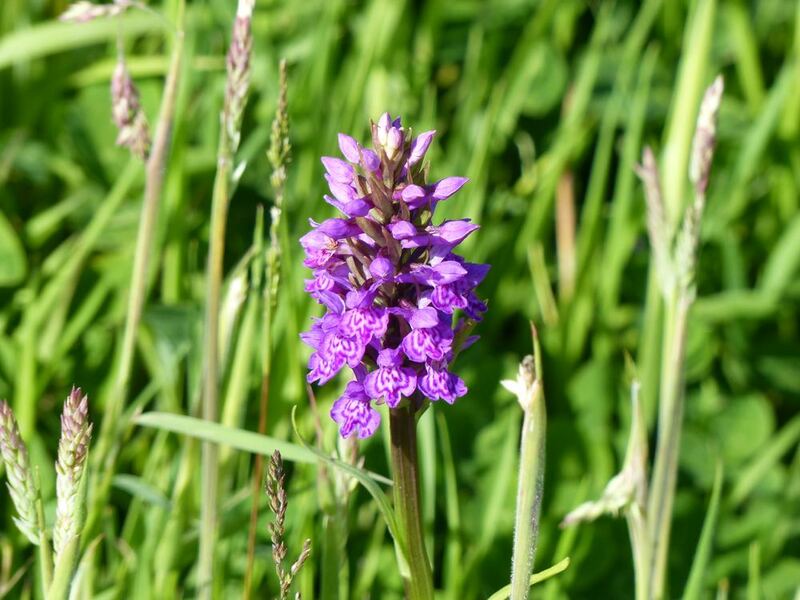 I took to stopping to spot wild orchids along the route – an unexpected bonus for the wild flower spotter. We eventually opted to fight upwards to the top of the path above Buckhaven Bay where there was a large signpost painted (too late for us!). The views over Buckhaven Bay were extensive, but the clouds were beginning to threaten rain again so we upped our pace as we wandered through Buckhaven towards Methil and Leven. 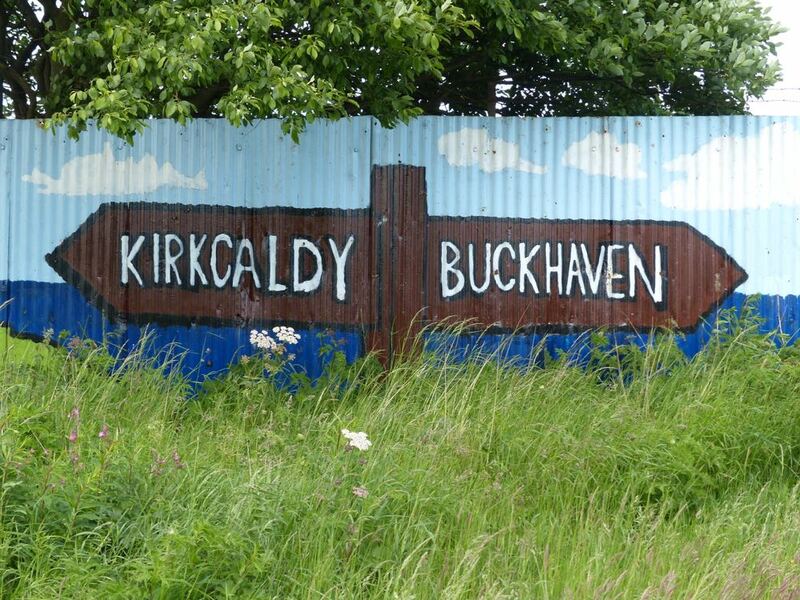 On the way through Buckhaven we lamented the fact that it was too late to find Stuart’s Bakery open as one of us had been promised one of their tasty steak bridies as a reward for completing the walk. We found lots of signage in the town about the social history of the area including the Net Factories, the Buttercup Dairy, the Globe Cinema and the Co-op. However all seemed to be in the past, with only the murals on the library to liven up the area. 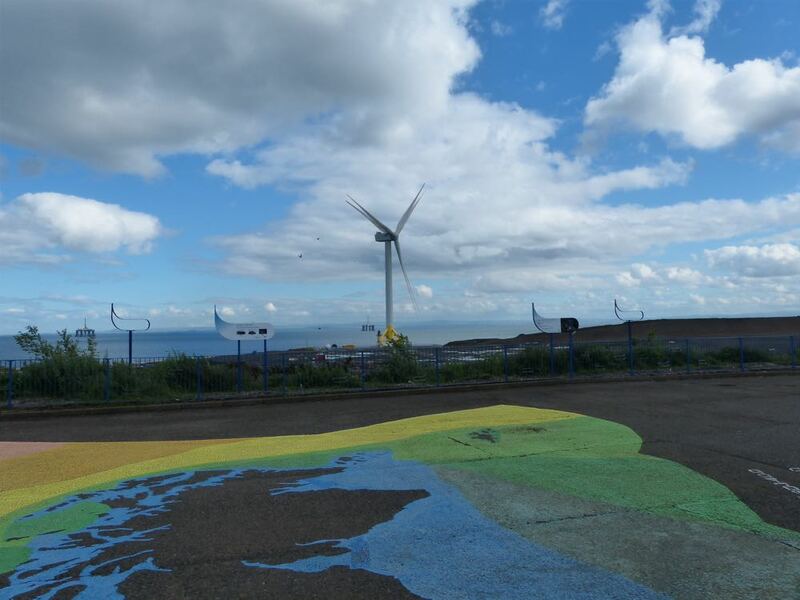 As we passed by Energy Park Fife we saw the yard where the giant wind turbines are constructed, as well as a display about Scotland’s energy. We were getting rather weary by this time of the evening, and were ready to head for home. 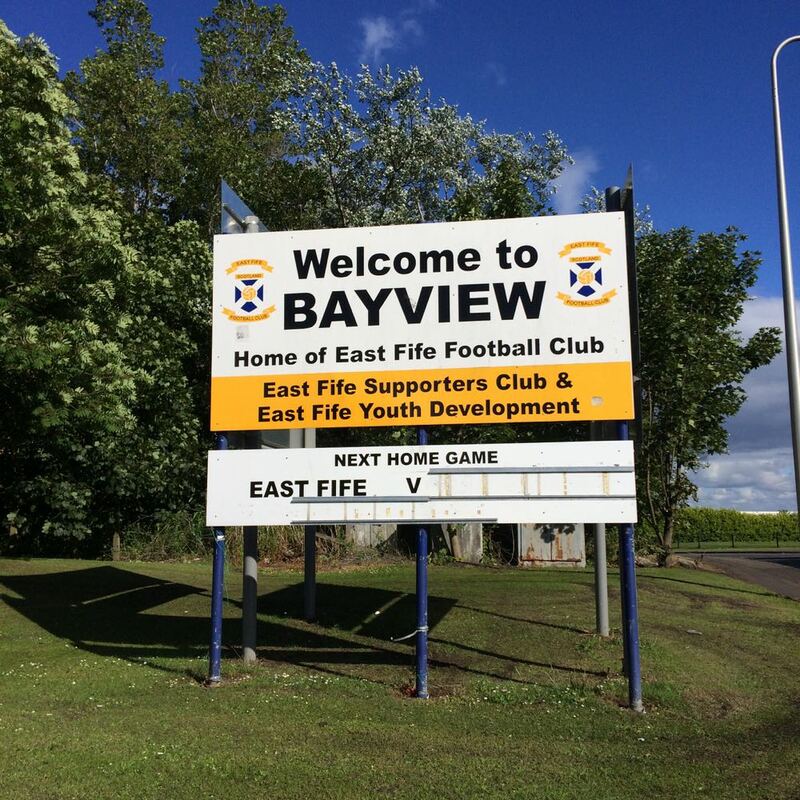 The path took us down through Methil and past the scenes of Fife football glory at Bayview Park, the home of East Fife Football Club. Having looked around the area for toilet facilities, we were glad to find that the Leven Swimming Pool was still open and happy to welcome weary and slightly desperate walkers! 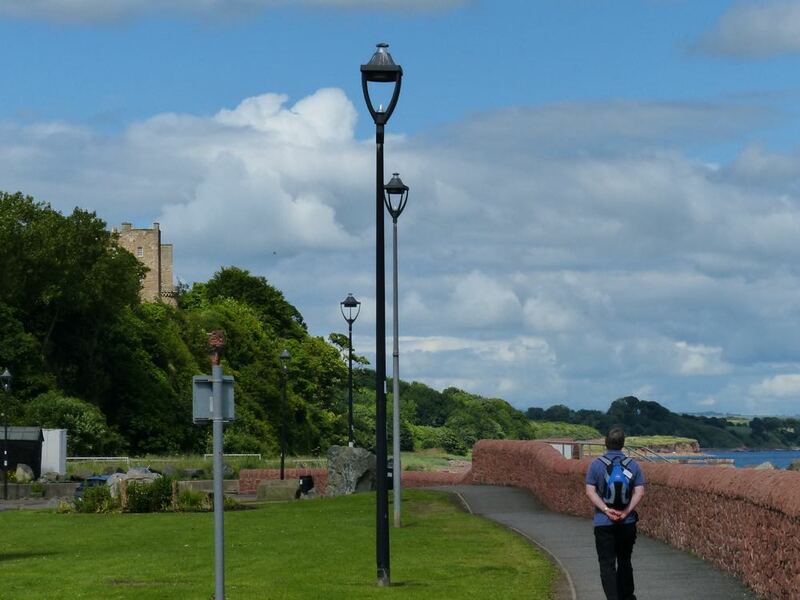 This section of the Fife Coastal Path is from Dysart to Leven and covers around 9 miles which was slightly too long for a comfortable afternoon stroll. However, having parked at Leven that was where we had to finish! 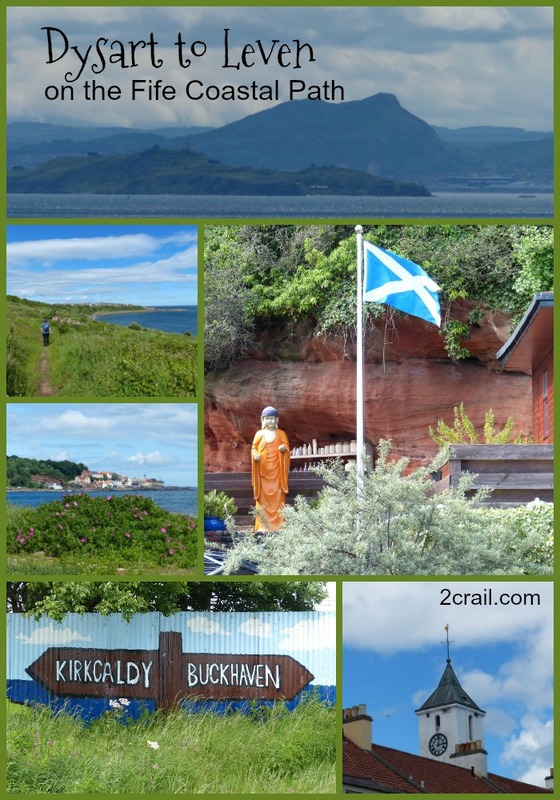 This was not our favourite part of the Fife Coastal Path, but we really enjoyed the next section – from Leven to Elie, so read on.